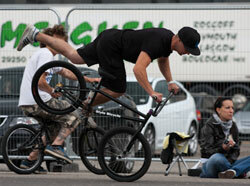 The UK BMX Battle took place in Milton Keynes today. It was supposed to be indoors but due to an insurance issue it had to be held on the parking lot outside the convention center. About 15 riders turned up and Keelan won the pro class!